1. Homegrown food is safer, more nutritious, and tastes better. When the latest salmonella or e-coli outbreak dominates the headlines, it’s comforting to know exactly where your food comes from and how it’s raised. And because vitamin content is depleted by light, temperature, and time, freshly picked produce grown near your house is more nutritious than conventional produce, which is transported an average of 1,494 miles before it reaches the grocery store. 2. Urban homesteading encourages healthy movement. When I started gardening and making more things around the house and yard, I noticed a side effect: I felt better. It’s not surprising. Digging the dandelions out of a raised bed, brewing an India Pale Ale, and peeling potatoes fall in line with the sort of daily activities most important for maintaining a healthy body weight, according to research conducted by Dr. James Levine at the Mayo Clinic. In Levine’s study, people were fed an extra thousand calories a day. Those who did the most daily non-exercise activity (as opposed to deliberate exercise for fitness) gained the least weight. 3. Urban homesteading helps families connect with nature and the seasons. Growing up in Colorado, I was fortunate to spend a lot of time hiking and camping. Gardening has given me an even more intimate connection with the natural world, since now I must work with it as a co-creator. And it has given my two young sons a wonderful relationship with plants and seasonal rhythms. They love the garden and beg to help plant seeds, pull weeds, and harvest. Every time one of them asks me if it’s pea or fig season yet, or recognizes an edible plant in someone’s yard, I smile. Those may seem like simple things, but for me as a kid, produce was something that was shipped across the country and delivered to a refrigerated section of the grocery store. 4. Urban homesteading is thrifty. It’s no coincidence the urban homesteading boom coincided with a worldwide economic recession. If you build your soil, save seeds, and tend your garden well, you can save hundreds of dollars on organic produce each season by growing your own. Keeping chickens can also save you money. We estimate that our eggs cost $3.35 a dozen (in organic chicken feed) at the most, compared to $5 to $7 for similar eggs at the health food store. However, we were lucky to inherit our chicken coop, so others may have to include that expense as well. Cooking from scratch saves us the most money. It’s not just that making stock, microbrews, and bread products from bulk ingredients is cheaper than buying them. As we’ve become better chefs, we’re also not as apt to go to restaurants, which used to be a huge drain on our finances. 5. Turning a lawn into a homestead makes productive use of land and supports healthier ecosystems. Most of us don’t have the skills or desire to garden on the scale that Toensmeier and Bates do. But by planting a few vegetables, herbs, or fruit trees, we create habitats for birds, butterflies, and pollinators. And by composting kitchen waste, chicken manure, and fallen leaves, we improve the ecosystem that supports all life. 6. Gardening and creating things boosts the spirits. Author Matthew Crawford traded his job at a Washington think tank for a career fixing motorcycles because working with his hands made him feel more alive. “Seeing a motorcycle about to leave my shop under its own power, several days after arriving in the back of a pickup truck, I don’t feel tired even though I’ve been standing on a concrete floor all day,” Crawford writes. We’ve all experienced the thrill that comes from making or fixing something. In her book Lifting Depression, neuroscientist Dr. Kelly Lambert explains that association. “When we knit a sweater, prepare a meal, or simply repair a lamp, we’re actually bathing our brain in ‘feel-good’ chemicals,” she explains. Lambert contends that in our drive to do less physical work to acquire what we want and need, we may have lost something vital to our mental well-being—an innate resistance to depression. I can attest to what Lambert says. Almost nothing is as satisfying as appraising a finished scarf or jar of sauerkraut, or cutting the first slice off a loaf of homemade bread. I have no doubt that creating something with my hands every day—even a meal—is imperative for my mental health. 7. 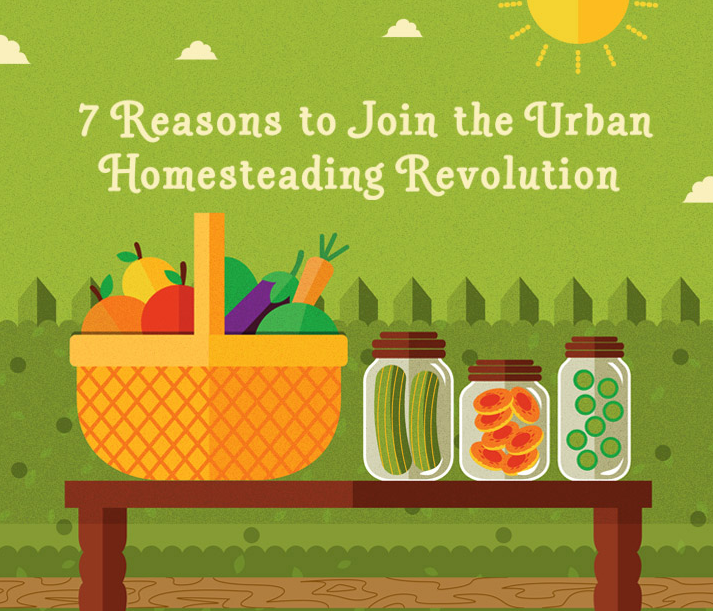 Urban homesteading encourages families to live, work, and buy more intentionally. These days, before we buy something impulsively, my husband and I are more likely to ask ourselves some simple questions. Can we make, fix, or do this ourselves, and is it worth the time and energy? Sometimes the answer is no. For me, canning and making clothing are not worth the effort. But just asking these questions makes our family more intentional about how we live and work, and what we buy. As a society, we’re often encouraged to make decisions based on two variables: time and labor. When it comes to household tasks, it’s usually seen as preferable to save both time and labor. While making a stew will take longer and require more physical work than buying a can, the process is enjoyable and good for the body. In addition, the homemade variety is healthier, tastes better, and brings greater satisfaction. Equations look different when you add in all of the variables. I hardly think of my family as urban homesteaders anymore, because the parts of the lifestyle that once seemed foreign and daunting, such as gardening, composting, and cooking from scratch, are now routine. They help us stay connected and make our lives feel richer. It’s powerful to produce some of what we need to survive, especially food.